Have you ever wondered what the difference is between 5w30 and 0w20? Or what would happen if you used the wrong oil in your car? These numbers are the viscosity grades of oil at low and warm temperatures and can have devastating effects on your car if you use the wrong one! There are two different types of oils– monograde oils and multigrade oils. Monograde oils, as the name implies, must only fulfill one viscosity requirement. Monograde oils, such as SAE30, are used for seasonal applications, such as lawn mowers and snow blowers. Multigrade oils such as 5w30, however, must meet two viscosity requirements and are intended for year-round use. We use multigrade oils in our vehicles today. The two viscosities of multigrade oils are notated as _w_ _, such as 5w30. The “w” stands for “winter”. We will use 5w30 as an example to explain this. The lower number, “5w”, refers to the low-temperature viscosity (“Winter”). The higher number following the “w”, 30, refers to the high-temperature viscosity (“Summer”). 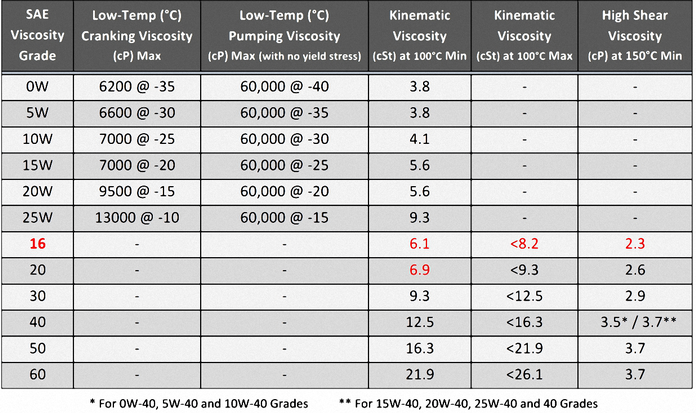 These viscosity grades are have been standardized by the J300 table parameters set forth by the Society of Automotive Engineers (SAE). The lower the “Winter” number is, the less viscous the oil is at lower temperatures. For example, 0w30 will flow better at lower temperatures than 5w30. The higher the “Summer” number is, the more viscous the oil is at higher temperatures. Therefore, 5w30 will flow better at warmer temperatures than 5w40. What Happens If I use the Wrong Oil? Using a heavier grade oil than your vehicle manufacturer recommends can cause higher engine loads and drastically reduce the life of your engine. Using a lighter grade of oil than your vehicle manufacturer recommends may under-lubricate the moving parts of the engine, resulting in excessive mechanical wear and shortened engine life. All info like this is very helpful & I’m sure very much appreciated by many who would like to be & stay better informed so keep it coming but hopefully you will go a bit farther & include a little more detail & possibly better explain the terminology & units of measurement used? Hey Jon! After doing some research I have seen that the most common oil type recommended in many Middle Eastern countries are 20W50 or 15W50. That being said, asking a mechanic in your local area would be the best way to ensure your vehicle is getting the correct oil!